Mississippi is considered the most obese state in the USA (according to the rational rankings). 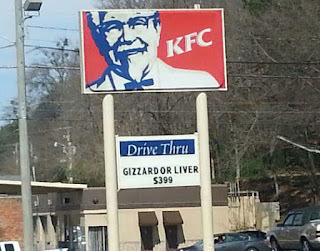 I do not know about you, but I have never heard of KFC running a national campaign to promote Kentucky fried gizzard or liver. When I was a kid, I'd collect packages of gum that came with stickers for spoof products humorously attributed to real companies. I can still remember the one for KFC. It was Kentucky Fried Chipmunk, finger lickin' crud. Now I am wondering: If Mississippi KFC sells gizzard and liver, does Kentucky's KFC have chipmunk or opossum on their menu? Have you seen strange regional food items on the menu of a national chain in your travels? I think I have seen liver on KFC sign in Indiana too. I will start watching.